“Oil and perfume make the heart glad, so a man’s counsel is sweet to his friend. I have friends far and wide, whom I love, but miss terribly. While I have always tried to tap into local community, because of our topsy-turvy lives, we have had to change communities and restart more often than I would like. I must admit, the older I get, the harder it becomes to do that. But it is necessary for survival, well being, and to feel connected to the place where you live. So my second Resolution this year is to root into community. I am grateful that one of my Yoga community members is also a part of my local community in Northeast Pasadena. Tanya is a fellow CorePower instructor who lives less than two miles from us. She and her husband JB blessed us with our stove, and we have had opportunity to break bread with them at their lovely, earthy place. She even popped over to bring me some of the beautiful antique roses from her garden! Knowing that we have not only a great neighbor, but a great Yogi nearby helps in my ability to take root and feel comfortable. We have plans in the works to get drinks after class soon. Sammy and Hermione are lifelong friends, and Hermione and I have been accountability partners for well over 20 years. While they are not close-by community, they are nearer than some of our other lifelong friends; so we try to make a point to get together with them and their son Jaxin. We launched the year at a fun event in our neck of the woods: The Moonlight Forest Lantern Festival at the Los Angeles Arboretum in Arcadia. It was a magical night of walking around in 40 degree weather (haven’t done that since Chicago), and admiring Japanese lantern displays that represented nature, California culture, and Japanese history. And I am really loving our local community in terms of food. I found The Barn, a late night Asian fusion eatery on Yelp. So after a crisp night walking and admiring the creativity and artistry, we were all happy as clams to sit someplace warm and fill our bellies! Sammy and Hermione are food adventurous, so they had a great Seafood Hot Pot, Fried Chicken, Chicken Hearts, and some Sauteed Green Beans, along with some Fried Rice, and French Fries. My “Mr. Orange Chicken” husband had some Chinese Sausage and Fried Rice, and some of my Pork Belly. Along with the Pork Belly, I had Chicken Gizzards, and a Lamb, Glass Noodle, and Vegetable Hot Pot which was so divine! Lynn even had a little bit of that. I also smashed some Pork Intestines wrapped in Asparagus and Chicken Cartilage—it’s a Southern and a foodie thing—don’t judge me! Washed down with a delicious hot Matcha, it all made for a moveable feast with our delightful friends. Another nearby neighbor is from our Montrose Church community, and she lives less than a mile away. If I had been feeling particularly ambitious, I could have easily walked to her house. Instead, I drove (so L.A. of me! ), but the purpose was to take a walk. Candice has a 4-year old, a 9-month old, and a 6-month old, but chasing Littles is not that much exercise. So we made plans to walk for 30 minutes. Candice packed Declan and Tara, her toddlers, into a stroller, and four-year-old Seamus was on his bike with training wheels, and we were ready to tool around the neighborhood. It was good to connect outside of 5 minutes before service, and it gave this childless woman a chance to love on and enjoy some babies, which I need every once in a while. With the torrential rains this past week, our plans for last Monday were derailed, but we hope to do it again when the weather and schedules allow. So, it’s a good start to the resolutions, and a good start in deepening roots. I am amazed that in one month, we will have lived in Pasadena for a year. Our circumstances are always precarious, so we don’t know the time frame for how long we’ll stay in this particular community; but while we are here, we’ll work at blooming where we’re planted. 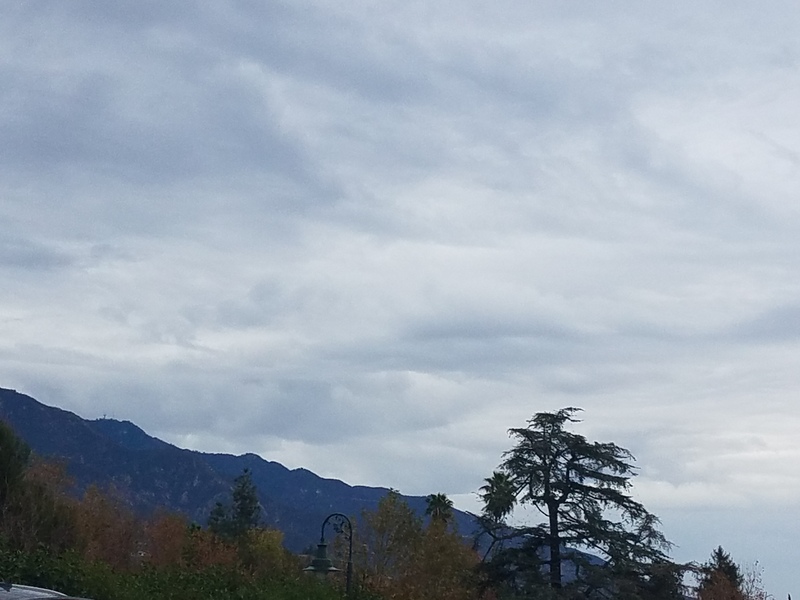 It was a gorgeous, steely morning in the Crescenta Valley. Los Angeles is experiencing its first rain of the season, so it added to the mellowness of this Monday morning. Our Montrose Church Women’s Coffee group was meeting at Panera Bread. I don’t really like Panera, and don’t quite understand what makes it so popular. Because we are again flat broke after having to travel to Chicago, the last thing I wanted was to go someplace where I had to spend money; so between that and the rain, I could have had a convenient excuse just to stay home. But the goal, particularly during this new year and time of grieving, is to connect as much as I can—especially on mornings when I really just want to curl into a ball—and this was one of these mornings. For a change, I left right after my voice lesson. Normally I dither around a bit, but I wasn’t sure what the 2 Freeway would look like with this first rain, and since I haven’t been firing on all cylinders lately, I wanted to take my sweet time and not feel rushed. So I arrived at Panera exactly at 9 a.m., and Jana, Sandy, Carolyn, and several other women were already in line, ordering their food. I gave them hugs, and then looked at the menu to see if there was anything I wanted to get. I decided to try a pastry (cheap), and had my eye on a pecan roll, when I heard a male voice say, “Hello!” behind me. I turned around to see my friend Robert, with his gorgeous smile, opening his arms for a hug, which I gladly took. Robert and his wife Gina have been one of the great friendships we’ve developed since coming to Montrose Church, and they knew about Joan’s passing. He asked how I was doing, and I said I was hanging in. He said something distinctive: “You have a certain grace about you that makes you appear that you are handling the situation.” I took that as a positive. We chatted a bit more, then I got back in line to order my pecan roll. I was happy that the pecan roll did not disappoint, and I was happy with my decision to get out the house. We had great conversation around the table about a variety of things, including movies, and the Faith & Film class a lot of us were attending. Our time together was winding to a close, and most of the women had left. My emotional bank was depleting, so I went to restroom, and then prepared to make my exit. I came back from the restroom, and was saying my goodbyes to the remaining ladies, when I sensed a pair of eyes upon me. I looked in the direction of the gaze, and saw the beautiful face of Darlene Perry smiling at me! I knew Darlene from The Church on the Way, where we sang together in the New Song Gospel Choir. Darlene and her sisters are also recording artists, as part of the talented Peri Sisters. On top of that, Darlene is an incredible baker and chef, and her cupcakes are simply divine. I walked over and gave her a big hug, and we caught up a bit on each other’s lives. She was in La Crescenta (all the way from Lancaster) to frequent a local bakery supply shop! She popped into Panera for a quick bite before heading back to the Antelope Valley. I introduced her to the remaining ladies, and then she collected her food and jetted off. We made a commitment to reconnect on Facebook. Some people would think that both of those unexpected meetings of a new friend and an old friend were coincidence; I choose to believe otherwise. For whatever reason, God knew I needed those bookends to my morning in order to shore up my soul for the rest of my day. Pastor Dave talked yesterday about God hovering over the void that is the chaos in our life, and those divine appointments were most definitely from his hand. This could be said of the road trip to Santa Fe, this one, and the trip through these past 50 Days to 50 Years. While I did not manage to connect with 50 friends over the 50 days, it was a very fruitful, fun, and enlightening experience, which carved a new space in the year and in my life: a larger space of gratitude for the people and events who have shaped the woman I am today, and a new space of embracing the legacy of years. I am thankful that I approach the 50s with few regrets, and a beautiful bouquet of people, places, and memories, including my husband, our marriage, and our life together. So the journey up to now has been mostly sweet, and my prayer is that it will continue to grow sweeter. I packed my things, gave my thanks to Gina for the use of her Air BnB, and said my goodbyes. Since we kept skipping a formal breakfast these past two days, I decided to meet Shawna for one last meal at Black Bear Diner before I hit the road. Black Bear is another Shawna find, and they have some of the best comfort food west of the Mississippi. One of their specialties is sweet cream pancakes, french toast, muffins, you name it. The sweet cream adds an extra layer of richness to the already fluffy texture of the bread, that is only enhanced by syrup, more butter, and whatever else you want to top it with. Had I been smart, I would have bought some muffins or sweetbread to take with me—maybe next trip…. It was delicious fuel for the body for the 6-plus hour drive back South. The car needed fuel too, so I gassed up at the Fairfield Costco before hopping the 5 South for a mostly uneventful ride back to Los Angeles. This is Northern and Southern California after all, and the traffic is legendary; but for the most part, the drive was smooth. I arrived home to ecstatic puppies and a happy husband, so perhaps a weekend getaway was a perfect solution to reset us. We would be celebrating 9 years married in two days, so a reset was a good thing. I also came home to a couple of sweet presents: a personalized gift basket from Lynn’s sister Carrie, and a lovely photo book from my sister Joan. The last day of 49 ended as desired: at home with the people I love, on a mellow note, with anticipation of things to come as I crossed the threshold into 50. Bea Bea’s appears to be the favorite in-between spot for this Los Angeles city-dweller and my West San Fernando Valley friends. And why not? I can always go for some Thai Tea pancakes! Larry Oya, his wife Shirley, and kids Jennifer and Allison are also longtime friends from the Congregational Church of Northridge. Larry was a pivotal part of Tuesdays with Transitioners, the career group I ran at CCN until 2014. He had weathered that particular career transition, and now he was going through another. Larry recently went through major spinal stenosis surgery, and was in the midst of rehab/recovery. He had attempted to go back to work, but corporate workplaces are all types of interesting when you’ve suffered a setback; so he stepped away again in order to continue his recovery. He had some time to come out to Burbank and hang for the morning, and it was delightful spending Day 4 of my 50 Days to 50 Years over coffee, pancakes, and conversation. We talked about his surgery and recovery, being on disability, and his career plans once he is able to get back at it. Larry is very wise, creative, and sagacious, and gave me some good insight into the male psyche and how to approach it. We brainstormed about some entrepreneurial ideas that he had brewing, and I put on my Tuesdays with Transitioners/Reinvention hat to encourage him to pursue these avenues, especially since he had some space to explore. Bea Bea’s was starting to develop it’s usual lunch crowd, and we had occupied the seats for some time. I had to prepare for one more class to teach, as well as pack for my fun weekend, so we said our goodbyes and headed to the different poles of the city. Thanks, Larry, for being a pivotal part of my life, and helping me celebrate 50 Days to 50 Years! It was so great on Day 12 to reconnect with The Escape Hatcher Susan M. Baker, and her little girl Mihret at SweetSalt in Toluca Lake. I met Susan through Douglas Welch, a friend and new media professional. Both Susan and Doug were pivotal parts of the career group I used to run called Tuesdays with Transitioners, and it was through New Media Mastermind, a group that Doug formed which included myself, Susan, Jennifer “Jungle Jenny” Michaels, Danielle Gruen, and Tracy Pattin, that the first CareerCamp in 2010 was born! Doug, Susan, Danielle and I were the first co-chairs, and the Congregational Church of Northridge, which sponsored Tuesdays with Transitioners, was the location. That was an exciting time, where we spearheaded three other Careercamps (L.A., South L.A. and Santa Clarita). We had a great time in the Mastermind group learning how to use new media to better promote ourselves and our endeavors, bouncing ideas off each other, and seeing how we could be instrumental in helping each other’s visions come to fruition. Susan also ran a group called Nohopreneurs, which brought local entrepreneurs together for lunch and networking. Both our lives have changed tremendously over the last six years. In 2010, Susan was in the process of adopting beautiful Mihret from an Ethiopian adoption agency, and had her in arms that next year. So for Susan, careers and reinvention took a back seat to new motherhood (of course). For me, the Yoga reinvention happened, and life has been a series of rollercoaster rides, a few of which I am still on. Susan was beautiful and glowing, so motherhood definitely suits her. Mihret was energetic and curious, as any six year old is, and exceptionally gorgeous—modeling should definitely be in her future. SweetSalt was a new find for me, and I will be back! Not only was the Duck Confit sandwich quite tasty, but they have natural sodas that rival any you would find in the grocery store. We caught up on our lives, discussing Yoga, travel, what was happening with the reinvention industry, writing, relocation, and education. Susan was involved as a volunteer at Mihret’s school, and I discussed my role on the CAAN National Board. She wanted to be an example to Mihret and emphasize through action the importance of education and being involved in its potential to change lives and allow students to flourish. I enjoyed the meeting of minds, particularly in the area of careers and reinvention. Susan is exceptionally smart and resourceful, and it hearkened back to our time in the Mastermind group—with the addition of interruptions from a bright and bouncy six year old. Thank you, Susan, for being a part of my 50 years: enriching my life with connection, vision, and also being a shining example of reinvention and new beginnings in the second half of your life. I hope we get the opportunity to collaborate again one day soon.